How the Thames Barrier works, and when it is scheduled to close. The Thames Barrier is one of the largest movable flood barriers in the world. The Environment Agency runs and maintains the Thames Barrier as well as London’s other flood defences. The Environment Agency operates the Thames Barrier every month for maintenance and testing. Once a year, they also test the barrier at a high spring tide (normally September or October). They may begin closing and re-opening the gates up to an hour before the times listed below. Very occasionally, the Environment Agency may need to change or cancel a closure at short notice. Please call the Thames Barrier to check: 020 8305 4188. The Environment Agency receives information on potential tidal surges from weather satellites, oil rigs, weather ships and coastal stations. They can forecast dangerous conditions up to 36 hours in advance, and will close the barrier just after low tide, or about 4 hours before the peak of the incoming surge tide reaches the barrier. They get information from a range of mathematical computer models that forecast expected sea and river levels. This is supplemented by data from the Met Office and real-time information provided by the UK National Tidegauge Network. This hydrological and meteorological data is fed into the control room every minute from a wide network of tide, river, pressure and wind gauges. Find up-to-date data for river and sea levels at the Thames Estuary and Teddington Weir. The barrier has no individual trigger level for closure. The closing process is guided by a mathematical matrix that considers the river flow, tide and surge at the time. The final decision for closure lies with the Thames Barrier Duty Controller. The Thames Barrier spans 520 metres across the River Thames near Woolwich, and it protects 125 square kilometres of central London from flooding caused by tidal surges. It has 10 steel gates that can be raised into position across the River Thames. When raised, the main gates stand as high as a 5-storey building and as wide as the opening of Tower Bridge. Each main gate weighs 3,300 tonnes. The barrier is closed under storm surge conditions to protect London from flooding from the sea. It may also be closed during periods of high flow over Teddington Weir to reduce the risk of river flooding in some areas of west London including Richmond and Twickenham. The Thames Barrier will then remain closed over high water until the water level downstream of the Thames Barrier has reduced to the same level as upstream. This is a managed process to provide for different circumstances, and takes about 5 hours. The Thames Barrier is then opened, allowing the water upstream to flow out to sea with the outward-bound tide. The Thames Barrier has been closed 184 times since it became operational in 1982 (correct as of March 2019). Of these closures, 97 were to protect against tidal flooding and 87 were to protect against combined tidal/fluvial flooding. 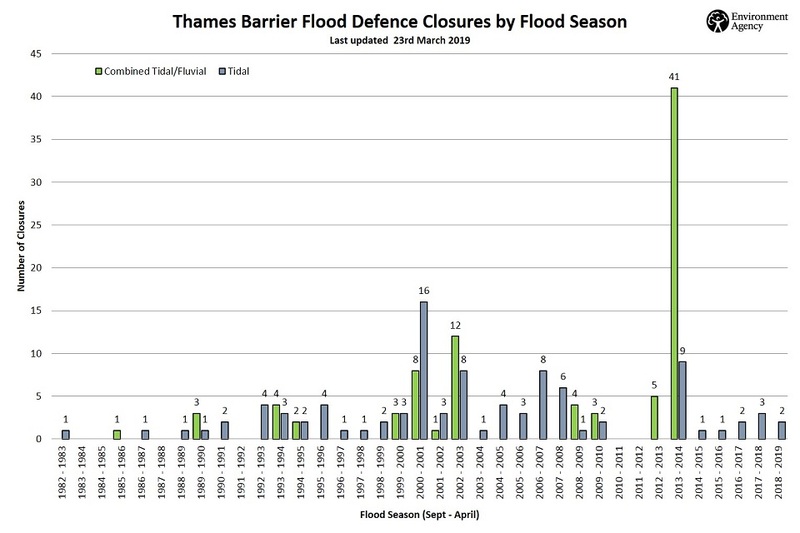 Thames Barrier closures since 1983. If you have an enquiry about the Thames Barrier, or would like to receive a project pack, email: kslenquiries@environment-agency.gov.uk. The Thames Estuary 2100 plan sets out how flood risk will be managed in the Thames estuary to the end of the century and beyond. It also recommends what actions the Environment Agency and others will need to take in the short term (the next 25 years), medium term (the following 15 years) and long term (to the end of the century). The plan is based on current guidance on climate change, but is adaptable to changes in predictions for sea-level rise and climate change over the century. More information can be found on the Thames Estuary 2100 page . 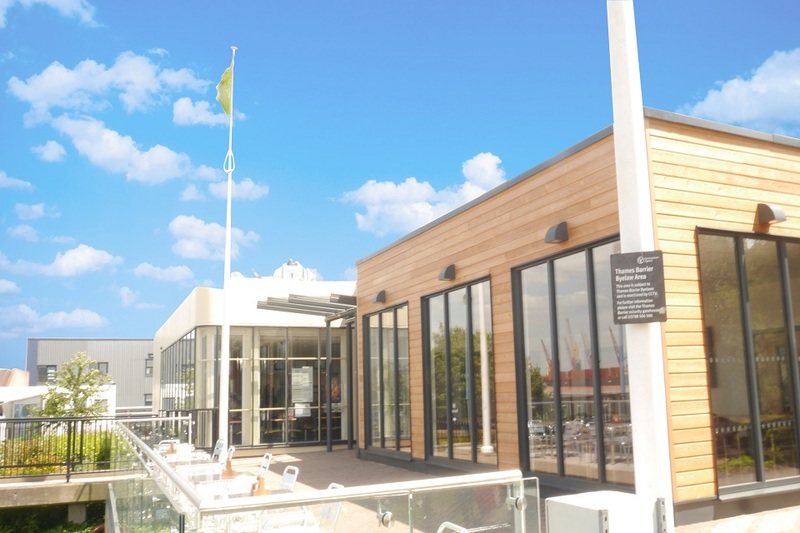 The centre has an additional conference room and improved outdoor seating area, which allows the Environment Agency to offer more availability for group talks and conferences. This new room has additional cover for winter group talks. For more Information call 0208 305 4188. The Environment Agency is currently upgrading the disabled lift, and the lift is out of service as of 4 September 2018 meaning there is restricted access to the Café. However, entrance to the Information Centre downstairs and toilets is still possible. This webpage will be updated once the new lift is completed. The Environment Agency apologises for any inconvenience this may cause. Group talks available at the Thames Barrier Information Centre for all ages. Please see price list. Please complete our booking form and email to thamesbarriertheview@environment-agency.gov.uk. Refreshments, light lunches and afternoon teas available to pre-book with your group talks please enquire for further details and costs. If you need any further information please call the Environment Agency on 0208 305 4188. 17 April 2019 Amendments made to opening times and group bookings section 17 April 2019. 28 March 2019 Updates to data and graphics made 27 March 2019. 28 February 2019 New graph and data uploaded 28 February 2019. 10 January 2019 Changes made 9 January 2019. 20 December 2018 New booking form uploaded 18 December 2018. 13 December 2018 New Booking Form uploaded 13 December 2018. 12 December 2018 Test closure cancelled for 13 December 2018. 29 November 2018 New opening times added on 20 November 2018. 30 October 2018 Update to closure dates made 29 October 2018. 8 October 2018 New information added 8 October 2018. 7 September 2018 Information on disabled toilet added. 21 June 2018 Disabled lift now working. 13 June 2018 Details on the opening of the new Cafe and Information Centre. 21 March 2018 New information for the Thames Barrier Information Center and Cafe. 16 February 2018 New dates for test closures added. 9 February 2018 Refurbishment of cafe delayed until June 2018. 1 February 2018 Numbers of closures updated. 8 January 2018 Two closures added to closure total. 29 November 2017 Correction to barrier closures. 8 November 2017 Information on the refurbishment of the Thames Barrier Information Centre and cafe. 10 October 2017 Data update 10 October 2017. 21 September 2017 Information about finding out if the Thames Barrier is closed via Floodline removed as service is no longer available. 15 September 2017 Thames Barrier Annual closure event information removed. 25 August 2017 New test closure dates, Cafe closing for refurbishment dates changed and warning to users of wheelchairs at the Annual Closure about access to river bank. 15 August 2017 Cafe opening at 9am on the Annual Closure day. 7 June 2017 New times added for cafe and information centre. 2 June 2017 Taken out that the disabled lift is broken as now fixed. 25 April 2017 Information on disabled lift being out of order. 28 February 2017 Notice that the Information Centre will be closed between 30 October 2017 and 28 January 2018 for refurbishment. 20 January 2017 Tall ships dates and the 2017 Thames Barrier annual closure date added. 16 November 2016 Cafe opening times updated. 15 September 2016 New opening times added. 5 August 2016 New information added. 4 August 2016 November to March closure dates and information about the Open Day on 2nd October added. 1 July 2016 Updated closure dates. 27 May 2016 Special offers for Father's Day at the Information Centre. 29 April 2016 New group bookings added. 9 March 2016 New Thames Barrier Information Centre group talk dates, price list and booking form added. 3 March 2016 Notice of event at Information Centre. 8 February 2016 Annual closure times for 2016 added. 27 October 2015 Updated timetable for group talks. 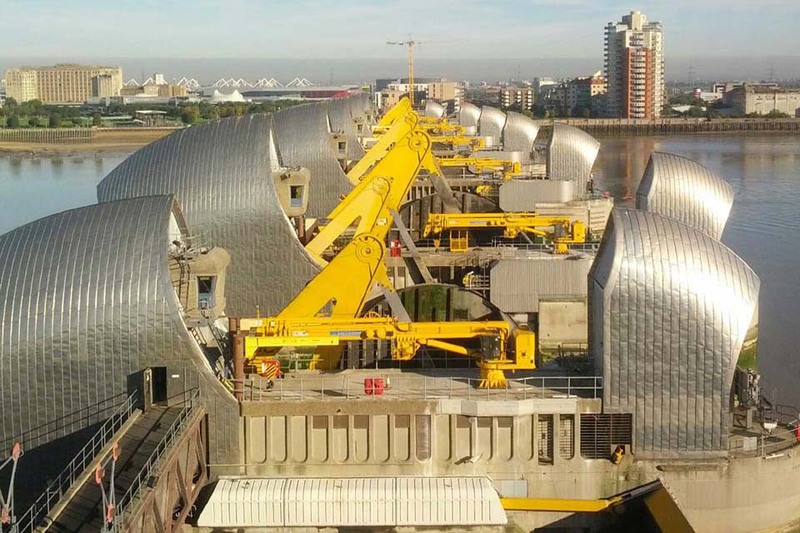 15 October 2015 Visiting the Thames Barrier section has been updated. 22 September 2015 Details added about the annual closure. 22 September 2015 Details on the annual closure have been added. 8 September 2015 Updated closure times and group talk sessions. 28 July 2015 In summer 2015, the Information Centre is open 7 days a week during the school holidays. 12 June 2015 The test closure dates have been updated, and there is a new link to our .gov.uk blog posts. 15 May 2015 New information for group tours of the exhibition centre. 30 April 2015 New Barrier closure information. 26 January 2015 Thames Barrier Information Centre prices from April 2015. 24 December 2014 Information on group talks added. 19 December 2014 Updated 'forecasting closures' section. 30 July 2014 Added new closure dates for 2015. 25 April 2014 First published.